Oh yes, it seems Lisbon has a twin across the Atlantic ocean (and land) – it’s San Francisco. I haven’t been to North America yet, but according to photos I could find there is a little bit of deja vu feeling regarding the two places! 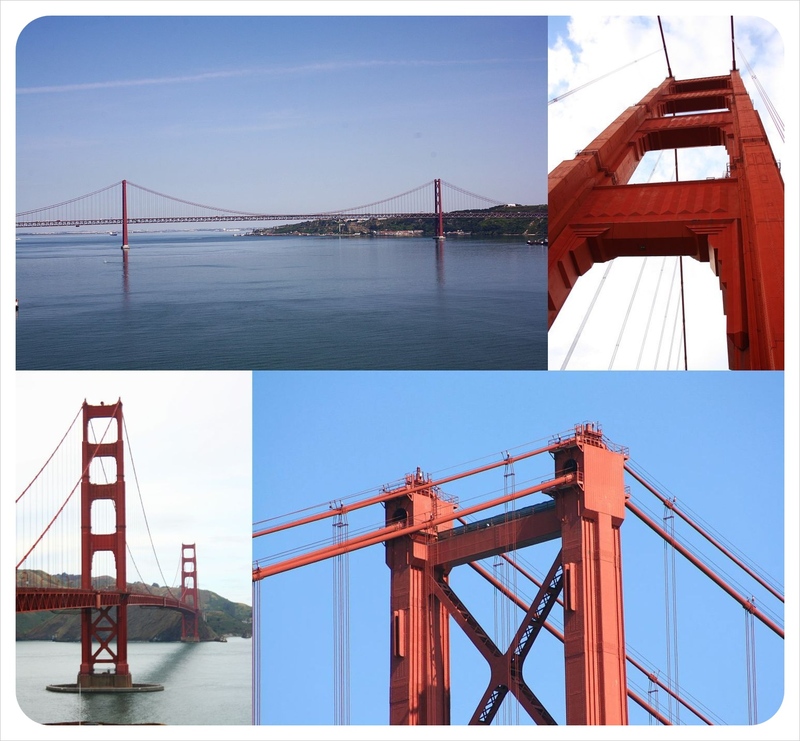 The similarities of those suspended bridges, iconic for both cities, comes from the fact that the very same company has built them, and, well, didn’t bother to “invent warm water” (as they say in my homeland) when it came to the bridge design (on the photo, Lisbon’s 25 Abril bridge is top left and bottom right, while the other two pictures are of the SF’s Golden Gate). The hilly streets are also characteristic for both, and there are exactly seven huge hills in each of the cities. There is a history of earthquakes in both, the similar mild climate, they are both situated between the bay and the ocean. Parallels go up to wine culture and street art! All this is nicely explained and supported by comparative photos at: http://globetrottergirls.com/2011/09/san-francisco-lisbon-twin-cities/. I thank the Globetrotter girls for the photo I borrowed, and to M. for discovering this story to me! P.S. Maybe this is all because California was discovered by a Portuguese, João Rodrigues Cabrilho (however, he was working for Spain).